Barnaby prides himself that he has been able to develop a professional speaking career alongside providing a full integrated marketing strategy programme for major corporates, small to medium enterprises and charities. With over 470 brand launches to his name, he has developed a comprehensive approach to enable a business to fundamentally change their systems and processes to become marketing led, key to the success of many businesses today. 2. Identifying your ideal prospect Psychographically, so you know who to attract at all times. 4. Capturing the prospect journey as a Brand Audit to identify what works and fix what doesn’t. 5. Constructing a business centric marketing strategy so everyone knows the role they need to play. 7. Executing creative brand building actions with partners who are experts in their field. Each programme tends to take place over 6-12 months and involves workshops, one to ones, internal departments and external services. If you know that this is what you business needs to get right to scale then drop us an email for an intial chat. 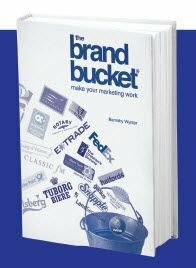 Alternatively you might like to read The Brand Bucket® : Make Your Marketing Work and see if it resonates with your view of marketing today.Available from Amazon here.